Great post and space, Victoria! And what a superb idea—keeping an egg timer on the desk. I will definitely have to try that, since I lose track of time so easily. Love it! Oh, It’s good to know I’m not the only writer who loses track of time at the computer! Thanks for stopping by. I enjoyed seeing your own creative space and learning more about you, Victoria! Our offices do say a lot about us don’t they? I’m pleased you enjoyed seeing mine. Thank you for your comment. Oh, my I sure hope no one figures out what my office space says about me! I love your space Victoria. It’s so clean and inviting. My space is cluttered because I’m always working on 10 different things at one time. Hubby is making me a new office and I can’t wait to move into that because I’ll have space to organize!! Love the egg timer thing. I think I’ll use that idea! I know exactly what you mean about working on several things at once. Actually, before you congratulation me on the clutter free zone, I should tell you that behind my chair I have a stack of papers to be dealt with. Great that you’ll soon be getting a new office! 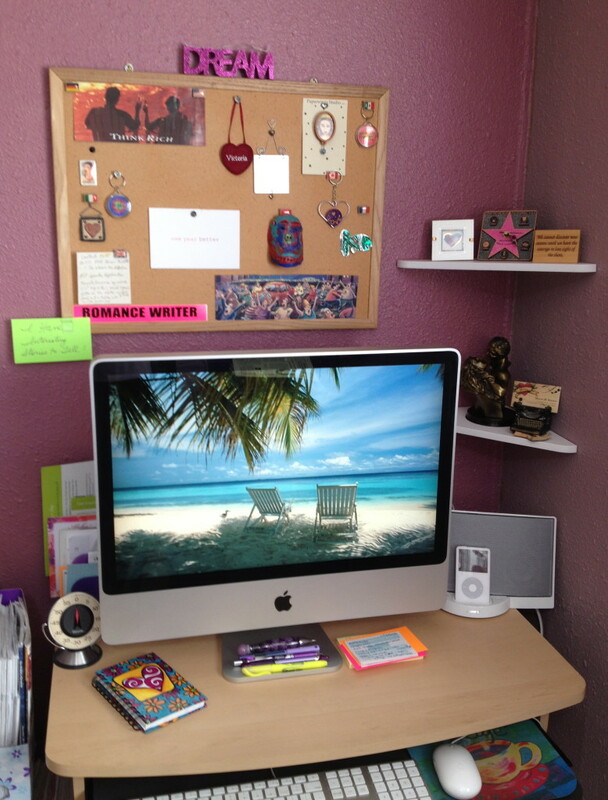 Your writing space is a delight, Victoria – colorful and creative without a lot of clutter. Love the idea of the egg timer. Don’t be too sure that if your home were larger, there would be enough space for all the books you crave. It doesn’t work that way. Books are a demanding mistress. What a great working space, Victoria! Not much bigger than mine – we seem to work in similar ways, though I can’t work with a timer – it would make me all jumpy. 🙂 But then, I hate ticking clocks! Enjoy your next writing projects! You are absolutely right. When we lived in a larger home I had hundreds of books. I had to donate most of them when we moved. Love your phrase “Books are a demanding mistress.” Very true! I hope the egg timer works for you, too. Thanks for stopping by! Very interesting post, Victoria! We have such different workspaces and it’s always so intriguing to discover the sacred spaces or dedicated spaces of others. I find this theme so appealing. Kudos to you for creating it! Thank you for sharing your thoughts. I am pleased to know you have enjoyed this guest series. I, too, am intrigued by the creative spaces of others and especially the spaces of writers. We are peas in a pod on this one! I absolutely love my kitchen timer. It keeps me focused. It helps me relaxed. Most of all, it keeps me writing! One caveat, though, try to find timers with pleasant buzzers. I bought a really cute one that looks like a ladybug, but when it goes off, it’s so obnoxious that it jolts me out of my reverie in a very unpleasant manner! ~Tui, swinging by from #Mondayblogs to say hi! Oh, you are so right! A pleasant buzzer is crucial 🙂 No one wants to be jolted by an annoying buzzer.